SEOUL, Oct. 29 (Yonhap) — South Korea clinched a spot in the next edition of FIFA U-20 World Cup on Monday with a victory at the regional qualifying tournament. 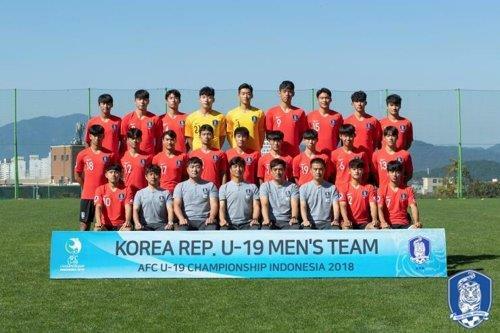 South Korea defeated Tajikistan 1-0 to reach the semifinals at the Asian Football Confederation (AFC) U-19 Championship at Patriot Candrabhaga Stadium in Bekasi, Indonesia, on Monday. Jeon Se-jin scored the winner in the 44th minute to send South Korea to the final four. The top four finishers at this AFC event will play at the 2019 U-20 World Cup, which will be held in Poland from May 23 to June 15. Coached by Chung Jung-yong, South Korea will face Qatar in the semifinals on Thursday in Jakarta. South Korea hosted the 2017 U-20 World Cup, and the young Taeguk Warriors have played at 14 previous tournaments. The country’s best performance is a fourth place finish in 1983 in Mexico.